The Clinical Immunology Society (CIS) and the Immune Deficiency Foundation (IDF) collaborated to celebrate National Primary Immunodeficiency Awareness Month in the U.S. this April and World PI Week, April 22 -29, 2016. The organizations view Awareness Month and World PI Week as a critical opportunity to educate the public about primary immunodeficiency diseases (PI). To engage the community, both organizations mailed IDF educational materials to all CIS members for them to share with their patients and families. During the CIS Annual Meeting (April 14-17, 2016) in Boston, MA, USA, members of CIS presented new research findings and discussed treatments for PI with more than 600 meeting attendees. 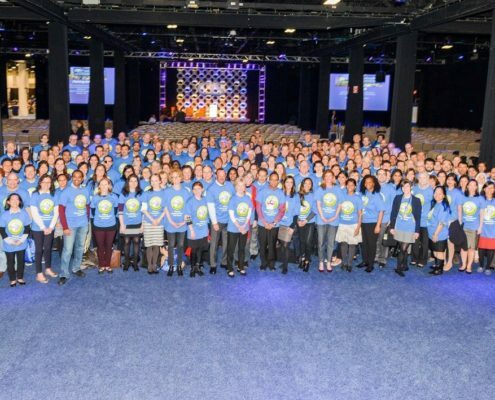 IDF distributed the Foundation’s materials and resources and gave participants PI Awareness t-shirts that encouraged people to “THINK ZEBRA!” A group photo was taken of meeting attendees wearing their primary immunodeficiency awareness t-shirts. The new Young Adult Webinar Series from the Immune Deficiency Foundation (IDF) was developed specifically for young adults to meet the needs and interests of this group. Participants can ask questions and discuss concerns with a live panel who share similar experiences of living with primary immunodeficiency diseases (PI). They can learn tips for tackling the unique issues faced by young adults with PI (ages 18-30), all while connecting with others in the community.